Home / Benefits of teambuilding / Love to play with fire? Building teams with fire! A brave team of twelve enjoyed a preview session of a PALEOVENTURES Teambuilding offsite today. 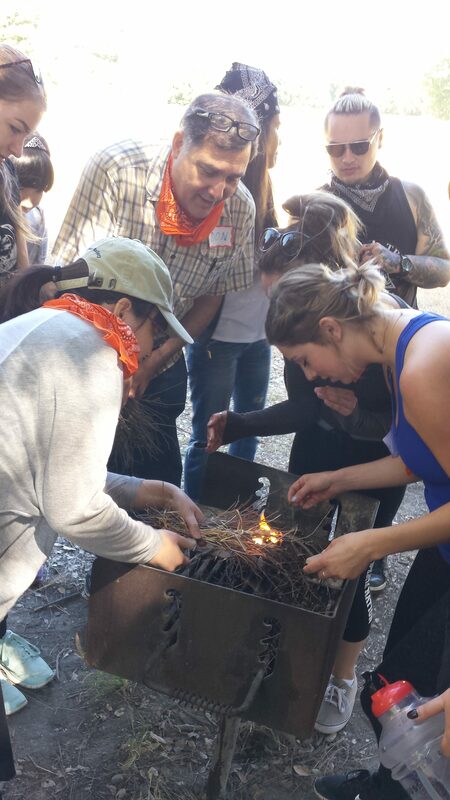 In the firemaking activity, they gathered the materials, made the bundle, struck the match and crossed their fingers. Like all activities, this simple task had multiple benefits. When a team manages to find the necessary materials, assemble them properly, light and manipulate the tiny flame into a real fire, they share a sense of accomplishment. Along the way, and after proper instruction, they have also learned and worked together to make decisions about where to look for materials, what materials to gather, how to assemble the materials, and how to communicate and work as a team to protect their fire. Teams, and individual team members, are often given unfamiliar tasks to accomplish at work. While each person brings unique skills, they often need to draw on the skills of teammates and colleagues to complete the task from beginning to end. Having had the experience of working together in the wilderness, they will have a greater appreciate of their teammates’ talents and feel more comfortable asking for help when they need it to accomplish an important work objective.